Chat software is a great way for companies to interact with customers and prospects online. While it seems difficult, adding chat to a website can take as little as five minutes. Install a small piece of code on your site and you should be able to customize how your chat looks, displays, and interacts with users. There are dozens of chat software options for different business needs. One option is Freshchat, a fully-featured live chat solution offering a free plan as well as three paid plans to help teams optimize and improve their customer communication. Find out more about Freshchat’s features by visiting their website and signing up for a free, 30-day trial. 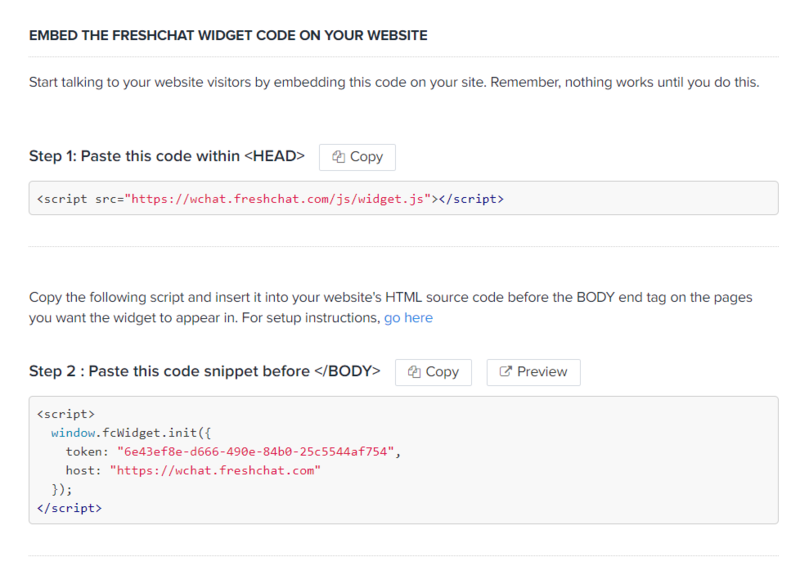 In order to add chat to a website, simply copy/past a snippet of unique code – provided by your chosen chat service – to your website. This will embed the chat widget on your site. While the code is unique, the process is fairly standard across all platforms. However, to complete this step, you’ll need access to your site’s content management system (e.g., WordPress). Live chat software’s main function is to enable quick conversations between a business and its site visitors. Features such as customized chat windows, auto-chat routing, chatbots, automated campaigns, and third-party integrations provide additional levels of customer engagement, depending on a business’ needs. If you need guidance on where to start, check out our comprehensive guide on the best live chat software for small business. With few exceptions, most chat software will ask you to install code only on the pages you want the chat box to appear. The homepage is an obvious first choice, but also consider the following pages: About Us, Contact Us, and Pricing. If you want a data-driven approach, use analytics to help determine which pages chat may benefit the most. With either Google Analytics or your marketing platform, review the top 10 most visited pages on your site. Then look at the conversion rates (visitors to leads and sales) for these pages. Compare them to the average conversion rates below from an analysis done by WordStream. If a page is converting under 2 percent, add live chat to the page. For pages converting over 2 percent, use chat judiciously. Here’s what I mean. If a page is converting well (i.e., anything above average—see chart below), it may be tempting to think chat is only going to help increase the conversion rate. However, there’s also the view that if it isn’t broken, don’t fix it. Err on the side of caution and try not to add chat to high-converting pages. If you want, A/B test high-performing pages to see if chat has a positive or negative effect. If you don’t have an A/B testing tool, you can also add live chat to specific pages for a period of time and compare the data. 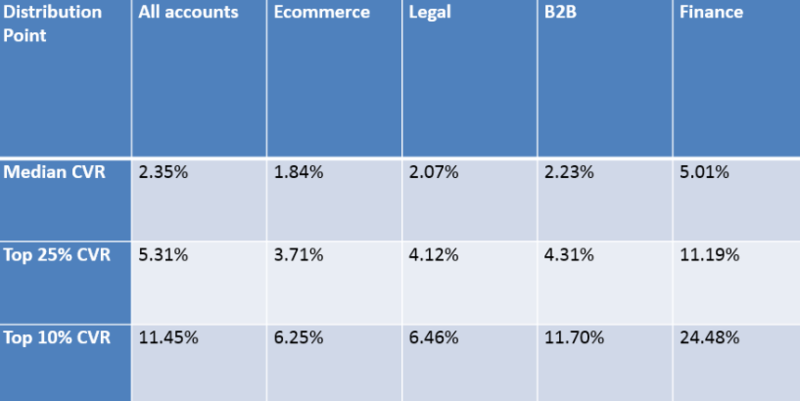 Average website conversion rates by vertical. Courtesy of WordStream. The final step is to embed your chat software’s code on your website. This typically happens in two parts. The first part is to copy/paste the code within your website’s global <HEAD>. Then, copy/paste a separate snippet of code before the body of each page you want chat to show up, commonly denoted as </BODY>. Specific instructions on how to embed this code can typically be found with your chat software solution. To help, we’ve included a screenshot on how it looks using Freshchat, a robust live chat solution. Installing chat code to your website. Image courtesy of Freshchat. Before launching live chat for a website, take time to customize the chat window. As this is the box that appears to site visitors, it’s best to take your time and make a good first impression. Consider things like the chat box color, text, size, and position. You’ll also want to set up custom things like how you receive notifications, deliver information, and collect data. As you’re customizing the look of your chat window, you’ll typically be asked to how you want to be notified of an incoming chat. For example, do you want an email, a desktop notification, a sound, or even all three? With some software, you can refine notifications even further as some provide the option of limiting alerts to newly started conversations or newly assigned, or choose to receive notifications every time a message is sent on any conversation. Arm your visitors with categories that help them find answers quickly. A chat window with common question categories lets them pick where they want to go. Additionally, a FAQ button in the window can provide quick answers without the need to bring on an agent. This can reduce the time your team spends answering basic questions and save your business money. One of the easiest ways to collect instant feedback is to activate a post-chat survey. This is included in most software and is usually customizable to some degree. For example, you can ask specific yes/no questions and then ask for an overall rating. You want the customer’s feedback, so keep it short and simple. Integrating live chat with third-party applications allows you to maximize your organization’s communication capabilities, which in turn enhance the overall customer experience. Popular apps like Facebook Messenger provide a convenient way for customers to connect with chat, while a CRM integration gives chat agents information and context about a customer before the chat even begins. 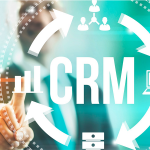 Connecting chat with a customer relationship management (CRM) tool benefits both the customer and agent. With this connection, the agent can see the customer’s (or visitor’s) history with the company, including things like what they purchased and when, chat history, and an overall profile of the customer. This gives the agent additional context about the chat before it starts, eliminating initial back and forth questions and making for a more productive, faster interaction. With 1.2 billion users, Facebook Messenger is clearly a popular way for people to communicate. The app also integrates with nearly every live chat software we’ve researched at Fit Small Business. It provides value in two ways: 1) it lets visitors connect directly through the app to a company’s messenger platform, and 2) it allows the agent to chat directly from the chat window. Everyone wins. The increasingly popular messaging app Slack has over 8 million daily active users. Counted among those users is the team at Fit Small Business. It’s intuitive, and most chat software integrates with it seamlessly, allowing agents to respond to chats directly from their Slack app. If you’ve used Slack, you know how easy it is to tag teammates to bring them into conversations, giving businesses another channel for quick responses and team collaboration if needed. Let the features of your software work for you by automating incoming chats, responses, and even the offers you make to customers. Automation not only makes your team more efficient, but it also helps reduce wait times for customers and creates more opportunities for sales. More advanced features like triggers may take some experimentation to implement, but others, such as canned responses and chat routing, can be set up right away. One of the best ways to ensure the workload of your team is evenly distributed is to automatically assign incoming chats. This feature sends chats to team members using round-robin scheduling, so each agent gets an equal number of chats rotating in and out of their queue. A common attribute of this is to preset chat limits individually. For example, a new agent’s chat limit will likely be less than that of a more experienced agent. Rule-based routing lets you automatically assign chats to team members or groups based on predefined filters, rules, and keywords. This feature ensures that visitors and customers are always routed to the right department or agent, increasing the odds for first contact resolution. It also takes the routing task out of the hands of a manager or other employee. 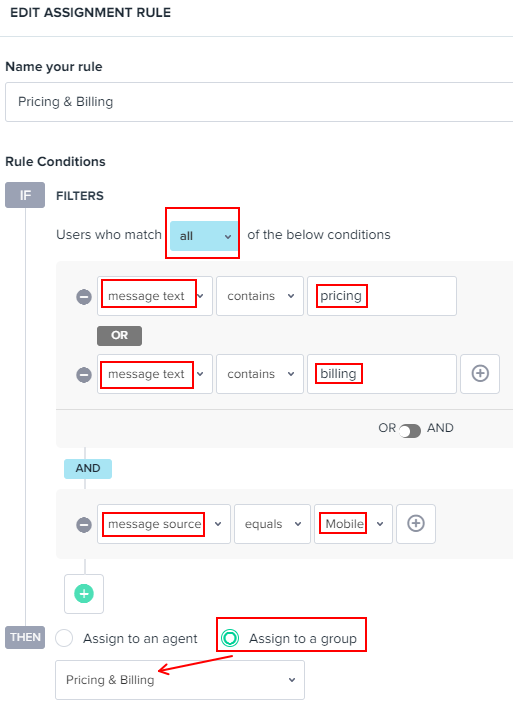 Here’s an example: Set a rule where chats that mention pricing or billing and are received from mobile chat are routed to the group called Pricing & Billing. This gets the chat automatically routed to the right agent, avoiding the chance that the customer will be passed on to someone else. Custom chat routing found in Freshchat. Canned responses let an agent create shortcuts for messages they use commonly, reducing the time spent typing. For example, an agent typing the message “Greeting” will appear to the customer as “Hello, my name is Luka. How can I assist you today?”, decreasing the words typed from 11 to one. Other common canned responses are conversation closings and answers to frequently asked questions. Triggers send automated messages through chat based on predetermined filters, such as a visitor’s geographic location, pages visited, and time on the current page. A common use for triggers is to boost ecommerce closing rates by reducing cart abandonment, which averages nearly 70 percent, according to research collected by the Baymard Institute. A trigger pop-up offering free shipping at checkout is one way to decrease abandonment and increase sales. Campaigns let you engage with messages targeted to specific customers, providing another way to be proactive and stay engaged. This feature can be set up for a variety of situations such as onboarding new users with tutorials, re-engaging lapsed users with success stories, gathering feedback, and sending company notifications. You would define who you are going to target by parameters such as whether they are a new customer, ex-customer, or customer who hasn’t visited in a while. Each of these segments of users can typically be filtered by location, language, email, first seen, last seen, and sessions. The filters provide a very granular way to target users based on the individual campaign. Chatbots use artificial intelligence to communicate with site visitors 24/7, answering questions and collecting information that can then be transferred to an agent when available. Not all chat software includes bot technology, but there are lots of third-party bot apps. The more sophisticated bots use machine learning to recognize patterns in conversations to do more than answer “if/then” questions. For example, during non-business hours, a bot can be used to collect information about a visitor. If a visitor is interested in learning more about your software, they can give the bot their contact information and what they are looking for. This information can then be automatically routed to the appropriate salesperson, who can respond accordingly. If the visitor wanted a software demo, bots can link to a salesperson’s calendar and schedule it without human interference. On the service side, bots can use webhooks (a method of passing data between applications) to automate tasks. For example, a bot can be connected to an ecommerce platform using a webhook to answer questions about a customer’s order. The customer asks about their order status, the bot then pings the ecommerce platform, and the order information is passed back through the bot to the customer. Live chat software like Freshchat has many automation features like auto-chat routing, triggers, campaigns and IntelliAssign, which routes chats based on agent workload and experience. It also has a built-in chatbot to capture leads and answer basic customer questions 24/7. Visit Freshchat for a free, 30-day trial. Whether you’re a team of two or fifty, set expectations from the start. Monitor your team and use reporting to understand what’s working and what needs attention. If you’re taking the steps to implement live chat and plan to follow some of the recommendations here, don’t just set it and forget it. Use the tools you have to coach and train employees and to improve the overall level of customer service your company provides. If you’re new to live chat, you likely won’t know what to expect of your team. Fortunately, others have done the research so you don’t have to. For example, the average order value is increased by 10 percent when live chat is used, and it takes 2 minutes and 42 seconds on average for an agent to respond. Use some of these as a starting point, and then adjust as you begin to get your team’s results for comparison. How many chats is your team fielding each hour? How long are conversations taking? Which team member is taking longer than average? A real-time dashboard lets you monitor the state of chat in your organization as it’s happening. For managers, this snapshot is crucial for understanding the hour-to-hour performance of a team. Issues can be quickly addressed before they become customer service liabilities. Reports provide a customized view of performance broken down by individual, department, as well as the overall team. Use these to make staffing decisions, track goals, and identify areas of concerns—areas that may be affecting your first contact resolution percentage. How Much Does Live Chat Software Typically Cost? Most companies offer three or four tiers, typically starting at around $15 a month per user for a basic package and going up to $60 a month for plans with advanced features. There are also a handful of free, very capable solutions. Most also offer free trials so you can test drive them. What Is First Contact Resolution & Why Is It important? First contact resolution (FCR) measures contacts resolved by a service team on the first customer interaction. It’s typically expressed as a percentage: divide the number of resolved first contacts by total incidents, and multiply by 100. FCR is an indicator of the overall health of a service team. The average first contact resolution rate for live chat is 70 percent. What Are the Chat Metrics I Should Be Measuring? Conversation volume, first response, response time, resolution time, incoming conversations versus resolved conversations, and customer satisfaction ratings are all common metrics typically included in chat software reporting. What you consider important will depend on your business and what you sell. For example, if you sell a software solution, your chat service calls will likely take longer than a business that sells hair care products. In order to add chat to a website, embed small pieces of code on your site, chose the chat box look and feel, and decide where it will display. This will create an efficient communication channel for your business that customers prefer. 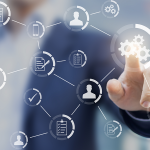 Advanced automation features might also be worth the initial investment in setup time, taking the burden of routing chats off the agents and onto the software. Freshchat live chat software includes features that can be implemented with a few clicks of the mouse. Advanced features like bots and chat routing with filters are also easy to set up and can improve the experience of your customers, giving your team the tools to provide exceptional service. Visit Freshchat today to schedule a demo or start a free trial.